Winter is still going here at FTB @ Mt Ruapehu, NZ. And the big news is there is an awesome park now set up for you to get your shred on!!!! We have our very last camp for the NZ winter on next weekend so come down and stay with FTB at our last camp for the 2010 winter. 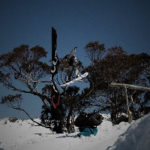 This three day camp will feature Turoa at its best, high spring with the Terrain park at its biggest and high temperatures making the snow slushy and soft to land the tricks you have learnt over winter. We will be cranking the BBQ every night and we’ll also have tech clinics from Leroy Christensen to get you on point with your park riding. This camp marks the end of winter for FTB so we will have massive product giveaways from our sponsors, yeah!! The FTB shuttle will be leaving Friday 22nd at 5pm from Ballistics snowboard shop Barry’s Point rd Takapuna arriving Ohakune 10pm. NZ’s Nick Brown Podiums in first FIS Slopestyle.